First of all, a man I often came across on my local dog-walking path died of a heart attack. I would often stop to chat with him while he walked his unlikely pair of white dogs. (‘Little and Large’, I called them – Little a small darting terrier, Large a huge lumbering French sheepdog.) He wasn’t young (68) but his wife, out with the dogs next morning, said he’d seemed to be in good health. Then a friend of a friend got bitten by an insect while out gardening. The man ended up in hospital in a coma, attacked by flesh-eating disease (necrotising fasciitis). Despite two amputations, he died. 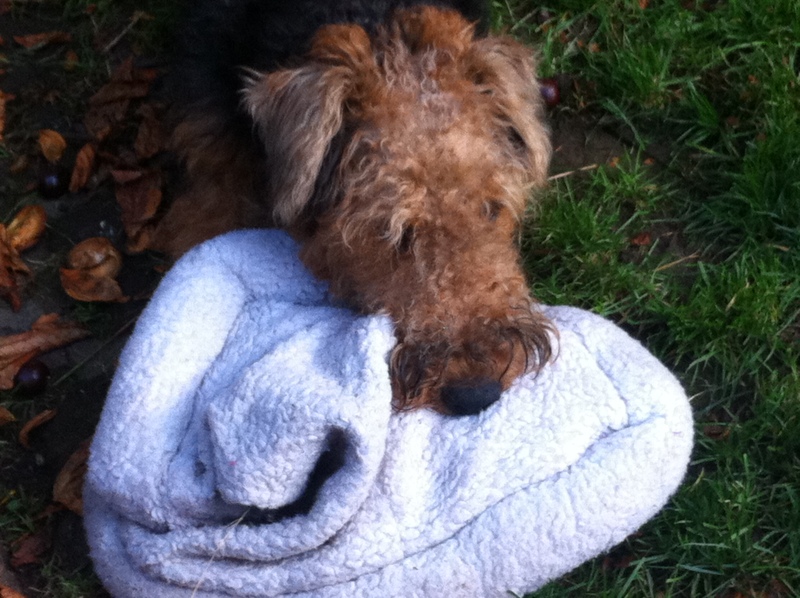 A few days after I heard from my dogwalker that our Airedale terrier, not yet two years old and in perfect health, collapsed on Hampstead Heath for no apparent reason while out on a walk and had to be carried half conscious into the nearest vet. The vet admitted he was perplexed at the dog’s symptoms, including an abnormally fast heartbeat, and told me to take him to a vetinary practice with diagnostic machinery. So I took Hoagy to his usual vet a mile or so away, where he was admitted as an emergency. The vet told me to go home, she didn’t know what the problem was but she would test his blood and phone me when they had some news. I called my husband and told him to come home from work, the dog was seriously ill.
Two hours later, I phoned the vet to ask what was happening. She said our dog was being given oxygen and had been put on a drip but he wasn’t responding. She suggested we drive him to a specialist centre ten miles away, where they might have better knowledge of whatever might be wrong. We sat in the waiting room for half an hour, ready for a long night. Then the vet called us in. In the last few minutes, she said, Hoagy had started to get back to normal. Tube still attached to his forelegs, our dog sat up for the first time in hours and looked at us. Relief is not the word. I had to stop myself from hugging the vet, who diagnosed anaphylactic shock. This is a rare condition (more so in dogs than humans apparently; she had not seen another case in 14 years). We’ll never know the cause. Perhaps it was a bite or sting, or the hoovering up of some left-behind drugs. Next morning I thanked the vetinary staff for saving our dog’s life. Hoagy was less boisterous than usual but still managed to bark like crazy when the postman arrived – never have I been more glad of that! Sitting in the garden with a cup of tea and Hoagy trying to get on my lap, I realised that no matter how much our dog’s frequent distractions annoy the hell out of me when I’m trying to do something, and no matter how much I want to scream when he runs off during a walk and doesn’t come back or he chews up my book or shoe, I wouldn’t be without him for the world. What’s more, even what seem like endless patience-sapping hassles designed to test me to the limit (especially since eighteen months ago when I relented and let my husband buy the puppy he craved, which just happened to be the most disobedient and difficult-to-train breed there is) aren’t really those at all. No, all those postman-growling, shoe-chewing, dog-being-a-complete-pest-because-it’s-meal-time-soon moments are actually the stuff of life. Temporarily they may be annoying in the extreme, but one day I will (universe permitting) look back on them with a smile.